researchers discovered that despite the security policies, procedures, and tools currently in place, employees around the world are engaging in risky behaviours that put corporate and personal data at risk , . Organizations provide easy access to databases for information sharing, storage and compression technology has allowed for more powerful (high-risk) endpoints , . An 80-MB mobile device now holds 6000 Microsoft Word documents or 7, 20,000 emails, and new 64-GB removable devices allow an entire hard drive to be copied onto a device same as the size of a pack of gum. These devices make it easier for employees, partners, or data thieves to access, move, or lose intellectual property or customer data. Mitigating data leakage from insider threats is a difficult challenge , . 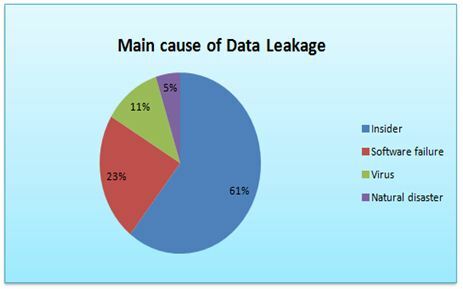 Data leakage can occur in many forms and in any place , . In the survey of United States in 2014, Cybercrime emphasizes on the seriousness of attacks caused by insiders of the companies. According to the survey report, companies experienced 37% internal attacks caused by insiders and researchers mentioned that the ratios of insider attacks are more destructive as compared to the attacks that are performed outside of the company. The ratio of private information that accidentally opens to the elements was 82% and in 76% of cases, confidential accounts were stolen . cache, external drivers and data on USB devices etc. Examples include: – data that is being written, revised, or deleted. 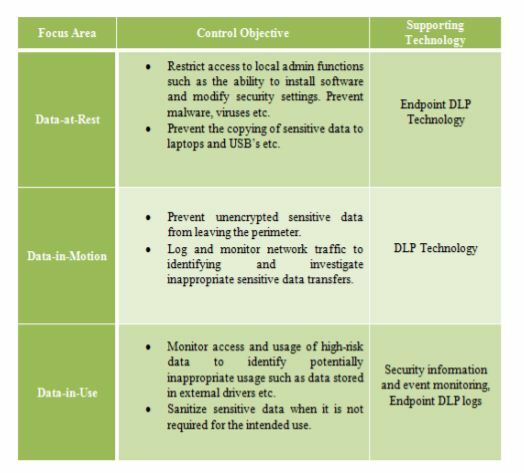 This section analyses the various works that have been proposed in the area of data leakage prevention. Tahboub et al. described the importance of the information regards to companies and the seriousness of corporate data leakage . 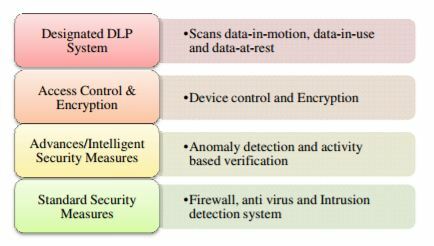 Paper studied the current systems used to protect data and the DLP system in terms of their components, methods used and the differences between them. 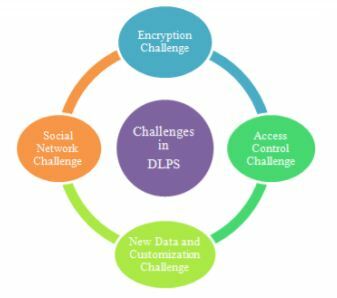 This paper explained the difference between existing systems and DLP system as well as described the importance of covering the shortage existed in current DLP systems such as developing policies, Integration with other systems like encryption, audio, video and images etc. groups where people belong to more than one group, or even more when new communication groups are formed, old one disappears. In this situation, it is difficult to reveal a person who leaks the data (an outsider) in a communication or to detect persons having limited access to data . blacklisting systems, also known as Signature- based systems that find the known attacks. 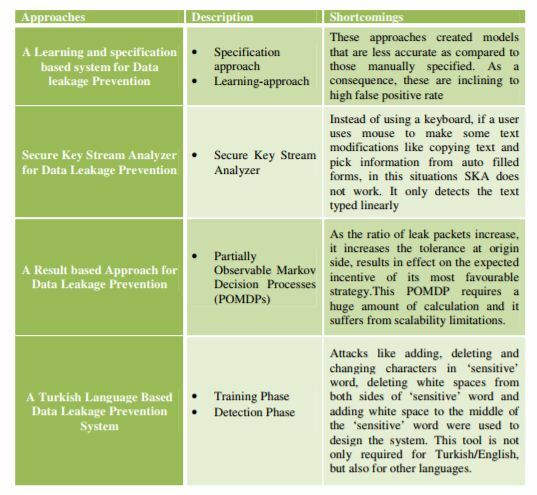 A specification-based white listing system is used to detect unknown attacks. required for Turkish/English, but also for other languages . Kamaljeet Kaur received B.Tech in computer science from Kurukshetra University,Haryana, M.Tech innformation Technology from KSOU, Mysore. She did Postgraduate in Management from IILM, New Delhi. She worked as Assistant professor inEngineering College for 4.5 years. Now she is working as a Vocational Teacher inGovernment Senior Secondary School, Ambala since 3.5 Years. She worked as a Co-ordinator during the National Technical Expo-09, sponsored by IEEE-SSCS & IEEE CASS India chapters, held in KITM KKR. She had presented papers on Analysis of Proactive and Reactive Routing Protocols in Congested MANETS based On Power Consumption and Cloud Computing and its aspects in INDIACom-2012, 6th National Conference on Computing For Nation Development by Bharati Vidyapeeth’s Institute of Computer Application and Management , New Delhi during Feb.23-24,2012. She attended a two day conference of Model United Nations organized in collaboration with UN Information centre for India & Bhutan, New Delhi. She actively participated in a two-week ISTE Workshop on Database Management Systems conducted by IIT Bombay from 21st to 31st May, 2013. Her area of interest is cloud computing, data base management system and mobile computing etc. Dr. Ashutosh Kumar Singh working as a Professor and Head; Department of Computer Applications;National Institute of Technology; Kurukshetra, India. e has more than 15 years research and teaching experience in various University systems of the India, UK, Australia and Malaysia. His research area includes Verification, Synthesis, Design and Testing of Digital Circuits. He has published more than 150 research papers till now in peer reviewed journals, conferences and news magazines and in these areas. He is the co-author of six books which includes “Web Spam Detection Application using Neural Network”, “Digital Systems Fundamentals” and “Computer System Organization & Architecture”. He has worked as principal investigator for four sponsored research projects and was a key member on a project from EPSRC (UK) “Logic Verification and Synthesis in New Framework”. Dr. Singh has delivered the invited talks and presented research papers in several countries including Australia, UK, South Korea, China, Thailand, Indonesia, India and USA. He had been entitled for the awards such as Merit Award-03 (Institute of Engineers), Best Poster Presenter-99 in 86th Indian Science Congress held in Chennai, INDIA, Best Paper Presenter of NSC’99 INDIA and Bintulu Development Authority Best Postgraduate Research Paper Award for 2010, 2011, 2012.